Although I didn’t always realize it, my new book, How to Live Forever, has been a work in progress for the past 30 years. For decades I’ve been on a quest to answer a set of increasingly urgent questions: How can a society with more older people than younger ones thrive? With so many living so much longer, what do the increasing years beyond 50 mean? How do we find happiness when we know life is long and time is short? My new book, How to Live Forever, is a personal account of the lessons I’ve learned on this journey, the older mentors who have supported me throughout, and my transformation from a younger person to an older one. Many have argued that the more-old-than-young world will feed a demographic divide characterized by conflict, disconnection and scarcity. But it doesn’t need to be that way. We know how to fix this situation — and it can fix us! Older and younger generations are built for each other, as just about any grandparent can tell you. When we connect across age, we find purpose, resilience and happiness. 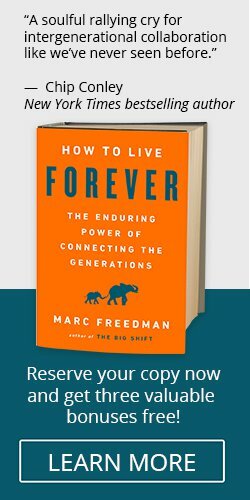 I’ve put all the answers I’ve got (and a few more questions, too) into How to Live Forever — to be released November 13. I hope you’ll reserve your copy today and make plans to give it to others in your life — the holidays are just around the corner! 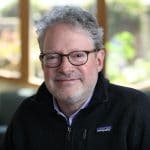 After celebrating my 60th birthday a few months ago — and as Encore.org itself marks its 20th anniversary this fall — I’m more conscious than ever of the passage of time and the urgency of our cause. We must join with younger generations now and build a better world together. We don’t have a person or a moment to waste. If you reserve your copy now, you’ll get free access to three valuable video trainings featuring several of my Encore.org colleagues offering tips to help you make the most of your encore years.